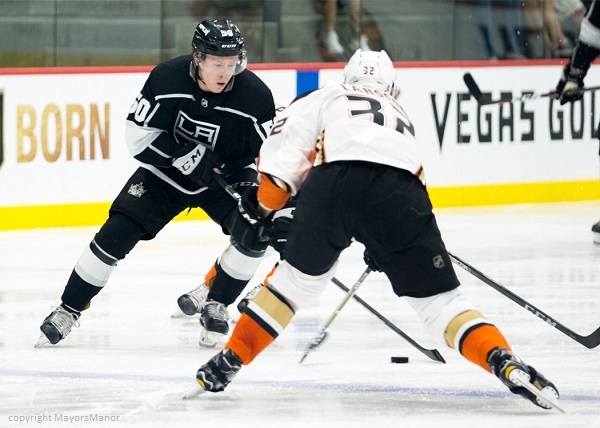 His line, rounded out on the right side by camp invitee Mark Rassell, combined for all three of the Kings goals in an 8-3 loss to the Ducks. Anderson-Dolan led the way with two goals and an assist. While the trio was officially listed as the third line, they seemed to get the bulk of LA’s ice time – especially in the third period, with the Kings trailing heavily. We also caught up with Eyssimont after the game to talk about his chemistry vs. communication with Anderson-Dolan. In late March, Eyssimont signed a pro contract with the Kings after three impressive years at St. Cloud State. 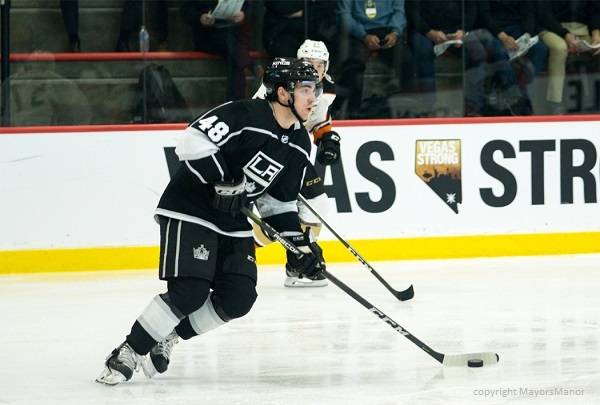 As he begins that transition to the AHL this season, where he’s expected to be a key contributor for the Ontario Reign, continuing his physical maturity will be among a myriad of tasks on his agenda. Moverare offered this assessment of the game – "We didn't sacrifice enough. We let them walk over us. We didn't play the LA system." Akil Thomas, the team’s second round pick in June, started on the second line (centering Brad Morrison and Sheldon Rempal). After taking a penalty in the second period, he appeared to not get much ice-time the rest of the game. However, Stothers didn’t necessarily agree with that claim. One thing noted to us by a few people in Kings management is Anderson-Dolan’s intensity level. There was no shortage of it on display after the game either. He was all business and focused only on what’s right in front of him. As for the NHL roster, never say never. However, from all indications to us, it will be extremely difficult for Anderson-Dolan to make the Kings opening night group. This has nothing to do with the talented center, yet nearly everything to do with the team’s salary cap situation. It appears the Kings will most likely open the season with 13 forwards, seven defenseman, and two goalies – or one short of the 23-man roster limit. Putting aside their early season road trip, where they will most likely take a full squad, that probably doesn’t leave a window for Anderson-Dolan at the moment. To get to 13 forwards, center Michael Amadio (waiver exempt) may need to start the season with AHL Ontario. Considering they likely wouldn’t want to put Jonny Brodzinski on waivers just to make room for Anderson-Dolan, the lack of spots available will be a challenge. Now, the Vilardi situation is an interesting one. Obviously, Kings management is disappointed he wasn’t able to attend the Rookie Tournament in Vegas this weekend due to ongoing back issues. Perhaps of bigger concern is the fact that we’re told he will not be available for the opening of main camp later this week. From what we’ve gathered, Vilardi will be in Los Angeles, yet he’ll be out listed as wee-to-week. Indications are his back issue isn’t something that will ever really go away; more like something that will require daily rehab during the season. While that sounds concerning on the surface, there are many players who faced similar issues during their playing days – including two guys named Wayne Gretzky and Mario Lemieux. That isn’t to put Vilardi in that stratosphere of player, more to simply say it can be managed if dealt with appropriately. How Vilardi’s back situation plays out this month remains to be seen. However, if he isn’t available to suit up alongside Kempe come opening night, our money says it will be Rempal in that spot over Anderson-Dolan. And before the hate mail starts rolling in – relax, JAD is only 18 years old and has a very bright future with the Kings. Besides, if they send him back to junior, he also has a spot waiting for him with Team Canada at the World Junior Championships in late December. That could be some invaluable experience for the young center. For more with Eyssimont, see the link to our previous interview below. If you would rather read a great tale of how Thomas went from being a Kings fan to a Kings prospect, simply click here now.